Wisconsin will provide you a place to escape your everyday life. How does spending the night in a castle sound? How about a resort and spa for relaxation? Maybe a bed and breakfast train is more your speed? Wisconsin has all that and more. Here are 15 of Wisconsin’s most perfect getaways. The Sundara Inn and Spa is the perfect place to get away for the weekend. The spa/resort is located just outside of the Wisconsin Dells and surrounded by forest. 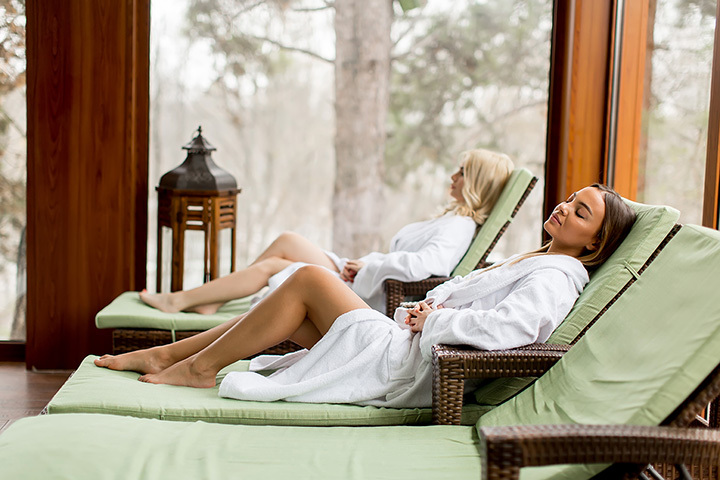 Get away from the noise and the stresses of everyday life by purchasing one of their relaxing spa packages. This luxurious 8,500-square-foot cabin is the dreamiest getaway. Enjoy the beautiful views of Eagle River, Wisconsin, or get competitive with the in-home game room. Enjoy the homey north woods décor and the castle feel of this beautiful rental. The unincorporated town of Minocqua the perfect place to get away. Rent cabins or hotel rooms, shop their quaint down town store, and relax on their chain of lakes. Water activities draw in visitors, but the towns charm keep them coming back for years. Travel through the Northwoods in a different way. Ride the Bed and Breakfast train. Enjoy hors d’oeuvres, drink bar, a four-course dinner on the train, a private room for the night, and complimentary hot breakfast in the morning. Order this Bed and Breakfast train ride for an unconventional getaway. It wouldn’t be right if we didn’t add Door County to our top 10 perfect Wisconsin getaways. Whether you become one with nature by setting up camp or staying at one of their beautiful hotel/resorts, there’s no better place to escape to, than Door County. Retreat to the Percheron Paradise Romantic Hideaway in Norwalk, Wisconsin. This place is exclusively for couples looking to getaway—whether that be to reconnect or to enjoy a short weekend after their big day. These secluded chalets are open all year around—for forth and create memories. The Grand Geneva Resort is the perfect place for a quick get away or an extended vacation stay. Grand Geneva is great for families or couples and offers so many activities in which will set this getaway resort and spa apart from the others. Holiday Acres Resort is located in Rhinelander, Wisconsin. Enjoy a plethora of actives like fishing, swimming, tennis and basketball courts, a sand volleyball court, a restaurant, and a quirky store. Your family will have everything they need on the resort making it easy to disconnect from the outside world. While the Wisconsin Dells may be one of Wisconsin’s biggest tourist attractions, it is also home to many great hotels and resort to escape to. Rent rooms, cabins, or camping sites to decide just how detached from the world you’d like to be. Fontana, Wisconsin is home to the beautiful Abbey Resort. Enjoy the beautiful views of their marina, relax at the spa, grab some great grub from their tasty restaurant. The Abbey Resort’s charming architecture makes them feel like a home away from home.